So in winter your priority is to keep your digits and toes warm, but have you ever thought about your lips? Well, there’s no need to keep them warm, but in our cutting winds and dry atmosphere, you definitely need to keep them conditioned. I don’t buy into any of the consumer literature that tells you you should exfoliate the lips. There are no oil glands that supply lubrication around that area, so scrubbing away with sugar or attacking your smoocher with a toothbrush seems a little harsh to me. Let me introduce a few lip balm alternatives to your average Blixtex or Carmex offerings that offer a bit of nourishing, as well as protection from the elements. This Aesop offering is more like a moisturiser for the mouth than a barrier lip balm, being quite thin in formulation. I would suggest wearing something thicker over top if you’re in particularly dry conditions. Along with the inclusion of aforementioned rosehip oil (sourced from the fruit of the rose plant and full of essential fatty acids, vitamins and antioxidants), other natural ingredients include coconut oil, shea butter, macadamia oil, castor seed oil, cocoa seed butter, and a handful of essential oils for fragrance and other aromatherapy benefits. The lip cream can be found online here, or at Luxe at 134 Liverpool Street. 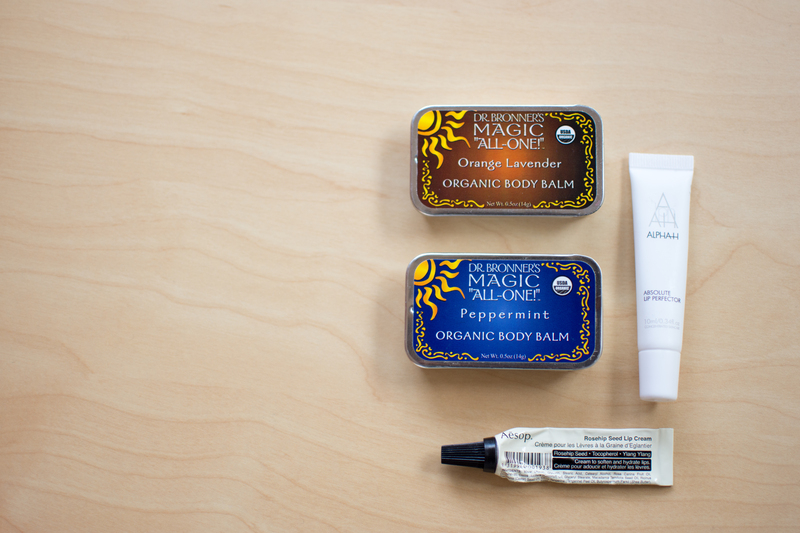 I have previously covered my love of Dr Bronner’s in the past, and the love continues in the form of their body balms – a tin of all purpose balm meant to be used for any dry or chapped areas of the body. Thanks to the minimal amount of ingredients and natural origins, the balm is also handy in healing newly drawn tattoos (and is similarly marketed as a great after tattoo care product). These balms come in a variety of flavours (again, all naturally derived from essential oils) and contain jojoba oil, beeswax, avocado oil, help oil, tocopherol (which is Vitamin E and used as a natural preservative) along with an essential oil or two depending on your purchase. You couldn’t go past a more basic but all rounder product. You can find the body balm online here, or at City Organics in Criterion Street in town. At the other end of the tech scale, we have my personal favourite from Alpha-H, an Australian originating company that is strangely little known on local shores, but as big as Jack Sparrow internationally. This cream is a wonderful balance of viscosity between the lotion like Aesop and the undeniable waxiness of Dr Bronner. It is one of the few lip creams I know of that has staying power without resorting to adding a tonne of mineral oil to the formula, and also includes a bit of zinc oxide for UV protection. You can find the lip protector here, here, and here.